These dark days in the land of Weinsteins and white nats demand action, in many forms, on many fronts. Even us old straight white guys, I’m guessing, have a role to play, above and beyond our most obvious and essential obligation—to listen up. As the editor of a literary magazine, I am—in some minor fashion, in a country that places little to no value on literacy—a gatekeeper. No way around that. A British-Italian artist once told me, back in the eighties, about another artist who was then plastering London with stickers that said, simply, “Not Art”. For the next couple of days, as I recall, the two of us went around Paris pointing out places where such stickers were sorely needed—and also recognizing a few that might have merited endorsement rather than denunciation. Back then, it was a game; for the past eight years, mutatis mutandis, it’s been my job. As an editor, it’s also my job to hear you out, to help bring your voices more fully into the world. It doesn’t really matter what I say, what matters is what we do, what we publish. In troubled times like the present, however, it may also be useful for our readers, and potential contributors, to know something more. Writing, and art in general, is a gift, given to the world; one hopes it will find a proper home. Our magazine, now nearly sixty, has over the years welcomed countless writers into its pages, yet, like any institution, MR is made of people. As executive editor, then, it is perhaps incumbent upon me to say what I care about most, and therefore what I most care to publish. Put most simply, though also most cryptically, here it is: what I don’t know already. What that statement does, I believe, is make me a race traitor. Such labels, I don’t need to tell you, are rarely self-assigned. Moreover, I actually regard the very idea of race as a weapon, not a concept. So why employ it here? Though I wish it weren’t so, I’ll have to go a long way out my way, and negotiate a series of looping detours, in order to peel that onion and come back a short distance correctly. You’ll have to be patient. For a start, I’ll say simply that I lucked out when I stumbled into my role at the Mass Review. If you look over the history of our magazine, with even a cursory glance, you’ll find that many of its most seminal publications explicitly challenged the extant (old straight white male) canon. 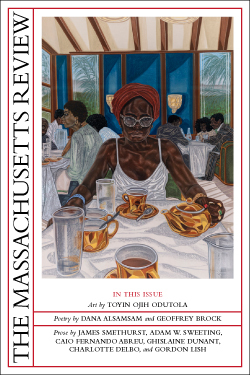 I don’t think our founding editor Jules Chametzky would object if I characterized cultural work of this sort as the central purpose and legacy—the heart—of the Massachusetts Review. In 1959, when we launched, T. S. Eliot was the god of English departments everywhere. I first read Eliot in the late seventies and—like everybody in my corn-fed corner of the wasteland—got schooled in the New Critical definition of what makes some stuff “poetry” and the rest refuse. I learned my lessons well, even if to me reading Thomas Stearns most often felt like meeting my mother by chance at the mall, when I’d gone there to hang out with friends. Try to imagine, then, the respect and weight I feel now, in helping guide the publication that first made space for Adrienne Rich’s “Blood, Bread, and Poetry,” the first to publish in English Roberto Fernández Retamar’s “Caliban” and Jean-Paul Sartre’s praisesong to Aime Césaire, the literary magazine that believed in Kwame Ture (then Stokely Carmichael) enough to publish his “Toward Black Liberation.” Not to mention what I always call our Civil Rights trifecta: JFK, RFK, and MLK. Not too shabby. Put in these terms, though, what you’ll hear (not incorrectly) is hero worship, a pantheon of our magazine’s household gods. What you’d miss—and I’d misrepresent—is the history that made this happen. In my office there is an entire file on the controversy caused by the Carmichael essay, back in the fall of 1966. I should, by now, have sat down with (founding chair of the UMass Department of Afro-American Studies, SNCC activist, and long-time MR editor) Ekwueme Michael Thelwell to hear him tell the story, but I haven’t, so I won’t try to summarize it here—except to say that one editor did resign when the decision was finally made to publish. And I can post here the editorial comments made on the first page of the manuscript in question. 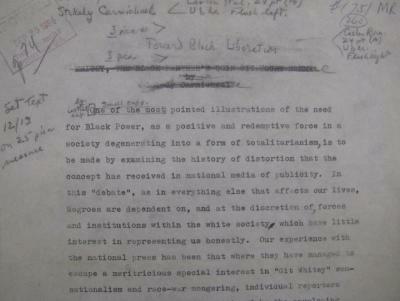 Note, in particular, that the essay’s title is penciled in, with the original (“WHITEY, THE BLACK PANTHER’S GOIN GIT YOURE MOMMA”) crossed out. Judging by database downloads and reprints, the most influential essay the Massachusetts Review ever published was Chinua Achebe’s “An Image of Africa.” It is certainly the single essay that I’ve read, reread, taught, and meditated on most since I took on this job. What folks probably remember about that piece is that Achebe calls Conrad a “bloody racist” (later changed to a “thoroughgoing racist,” in a revised version of the essay I’m told Achebe came to prefer). What folks don’t know is that the MR editors, according to Jules, were nearly evenly split on whether to publish it at all. In the end, of course, we made the right call, but the magazine also decided to include in that same issue a rather conservative piece, one that the Achebe-backers definitely didn't want to publish. The moral to my stories should be clear: even the best decisions only become obvious well after the fact. In the story MR, as in history itself, nothing has to have a happy ending. "[T]he question is whether a novel which celebrates this dehumanization, which depersonalizes a portion of the human race, can be called a great work of art. My answer is: No, it cannot." In notably different ways, both Phillips and Mengiste disagree with this claim. There’s not room here to say much about the distance they take, or to stake out a counterposition of my own. Most important, I believe, is how both writers describe their engagement with Achebe to have been central and generative to their own work. "That afternoon I didn’t change my opinion of Conrad but I began to rethink my diasporan relationship to Africa and, by extension, to the whole African diasporan family." Phillips, I think it no exaggeration to say, has since become one of the most eloquent storytellers ever to write of the African diasporan family, and in a single sentence he places Achebe as the catalyst for those stories. For the history of literature, that was a very important afternoon. Maaza Mengiste’s contribution to the colloquium was, if anything, even more moving. She commented upon two recent examples from global visual culture: the 900,000 ceramic red poppies recently placed around the Tower of London, as a memorial to the British Commonwealth soldiers who died in WWI; and the “young man in an orange jumpsuit . . . paraded across a sandy hill and made to kneel” as well as “another group of young men, black like me . . . marched across both sea and sand and forced onto their knees.” Her meditation focused primarily on the ISIS videos; she asked whether, pace Achebe, we still believe that art “can only be on the side of man’s deliverance and not his enslavement,” arguing that art is, “by its nature both a tool and a weapon, both a salve and poison.” I should add that, when she came to UMass, Maaza had no idea that Jim Foley—a reporter beheaded by ISIS—was a graduate of our MFA program; she was horrified when she found out, though we assured her that her talk was all the more important, for that very reason. Her question is crucial, and her early meditation on this topic is a work I’m proud to have published. I hope, at the very least, the series of anecdotes above will make readers think about how what we consider “good” in literature is variable, contingent, indivisible from other concerns. And how the battle to expand and challenge definitions of quality invariably involves material that we’ve been taught not to like. As far as connecting my core statement of value (what I don’t know already) and the label I’ve claimed in my title, well, more on that to come—I promise!